This year's trending jackets and coats show that outerwear doesn't have to be boring, as the viral coats have playful fringing, fun prints and bright paint-box colours. Ganni has created the most hyped jacket of the year: a white leather cowboy-inspired jacket with fringing along the shoulders which has been a real hit with the street style crowd. Miu Miu has also been behind many of the most-photographed jackets of the year, including a glossy leopard print trench and a checked fringed blazer. There are also a number of high-street jackets that are selling out just as quickly, including an & Other Stories wool blend blazer that defies its price tag and a green denim jacket from Whistles that also comes with matching trousers. Keep scrolling to see and shop the eight cult jackets that you can still buy. 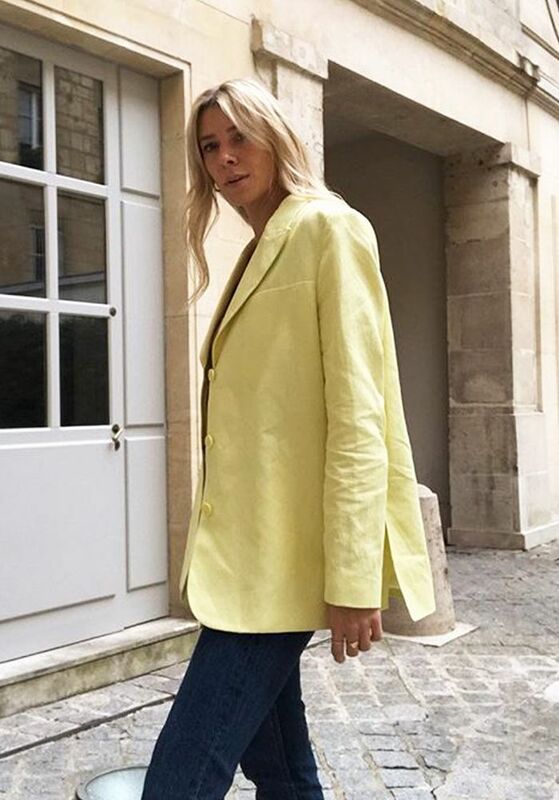 This lime-coloured & Other Stories blazer isn't available yet, but we love the similar linen single-breasted jackets that are out already. When it comes to trophy designer purchases for 2019, this Miu Miu fringed checked jacket was one of the standout pieces this fashion month. London-based stylists have been loving this checked shacket by contemporary label A.W.A.K.E. This green denim jacket with boxy pockets along the front isn't like anything else we've seen on the high street this year. Miu Miu has done it again with this glossy leopard-print trench coat. This boxy blazer keeps selling out from & Other Stories, and we're not at all surprised because it's such a classic. The Frankie Shop is where power influencers are turning to this year for unusual pieces that stand out in street style pictures, such as this patchwork bomber. Every year, there's one Ganni item that goes viral, and we're willing to bet it's this white Western-inspired leather jacket. Every influencer and buyer we can think of has been wearing it—and it's still available.